Ballet 5:8 is an imaginative, hard-working group of artists with some very carefully thought out ideas. Founded by Julianna Rubio Slager and Amy Kozol Sanderson in 2012, they have steadily built Ballet 5:8 into an aesthetically ambitious gathering of dedicated dance artists. From just six dancers their first year, “performing wherever there was an opportunity” as their site tells the story, their season — still growing — now includes forty performances a year. One of those performance promises to be a showcase for their thoughtful, but rigorously professional approach to concert dance. 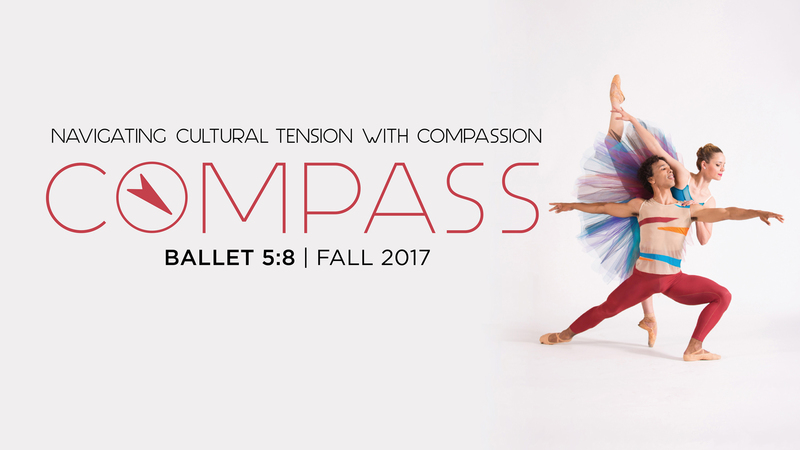 On Friday, November 10, they bring their new evening length program Compass, a collection of four works, to Chicago’s Auditorium Theatre. As we’ve learned more about this company, and about Compass, we’ve become more and more aware of how intricately and carefully imagined the choreography, the construction, and the performance of these four works is, so we thought we’d better ask choreographer and Artistic Director Juianna Slager to tell us about it. Johnny Nevin: You founded Ballet 5:8 with Amy Kozol Sanderson, the Company’s Executive Director, just five years ago, and the Company has already established an impressive presence — forty performances a year, a very polished and informative website, a YouTube channel full of high quality content, and a school and training program. What do you think some of the challenges are for anyone who has a vision of building a successful independent arts organization, especially a dance company, and how did you address those in your successful development of Ballet 5:8? Julianna Slager: Dance is a notoriously hard field to get started in! There are so many challenges related to getting funding, producing at the professional level, and establishing a mature, unique identity that isn’t “just another dance company.” Amy, myself and countless others have had to be willing to put in a huge amount of volunteer hours in order to build the company during these early years – we are talking 12 and 14 hour days in many cases, and it is sometimes still true today! We’ve also had to be willing to simply start at the beginning and walk through those frustrating rookie mistakes that are a rite of passage before you can really get going in a good rhythm – grow from them, and not look back. Pure persistence, a strong team of dancers, a dedicated board and staff have all contributed to the growth we have seen these past five years. Our commitment to putting our best foot forward, even on a low budget, and our willingness to constantly evaluate what we are doing against our mission and vision has helped us to garner support and develop a consistent identity over the years. We have certainly not arrived, but we’ve come very far! The heart of our organization is truly the vision and mission, and that has held us together through thick and thin, year after year. Johnny: In the Company’s excellent video about Compass, you describe a little bit about how each of the four works in the program explores a different aspect of compassion, and especially in the context of a very troubled world. Can you tell us more about the four works in the program, about the inspiration for each work, but also about your choreographic approach? Julianna: The four works in Compass are extremely diverse, yet they give an outlet to express and discuss some of our societies most pressing issues. I took those rhythms and tried to physicalize movement that mirrored that rhythm, by using ballet, but deconstructing and reimagining traditional movement, until it looks almost nothing like a traditional ballet. All God’s Children is a ballet based on a poem by Sojourner Truth. The poem states that if God created all people, then He created every shade of skin color. This leaves little room for prejudice. The ballet approaches the issue of racial tension and diversity from a fresh perspective, through the lens of an imagined world. Four distinct cultures go from creation, to isolation, to tension and ultimately to finding out that “we’re not that different after all.” The ballet shows the development of culture and the beauty of what makes us distinct, without forgetting what binds us together. The choreographic process was heavily based in the idea of “physicalizing dialect.” The dialect of a culture can give you a huge window into the values, history and direction of the people. I used music by John Adams with a heavy, percussive rhythm that serves as the underpinning for the dialect for each of the four cultures. From there, I took those rhythms and tried to physicalize movement that mirrored that rhythm, by using ballet, but deconstructing and reimagining traditional movement, until it looks almost nothing like a traditional ballet. I tried to work from vocalizing movement and seeing what effect that had on my body, and then I extrapolated that into movement phrases. This process of using dialect to drive the movement ultimately created a hugely unique set of divertissements that are the center-piece of the ballet. This is a 21st century interpretation of the centuries old book of Psalms. This ballet fits very well in the context of Compass, because it gives us hope and peace to hold onto in the midst of a range of circumstances. Shades of Refrain is a series of heart cries from the created to the Creator. Some are cries of joy and elation while others are moans of despair when words can only belittle the emotion. The ballet unwraps the human heart and the poetry of our most intimate moments. It’s the melody that underscores our human existence and our search for meaning, finding the answer in communion with the Creator. This is a 21st century interpretation of the centuries old book of Psalms. This ballet fits very well in the context of Compass, because it gives us hope and peace to hold onto in the midst of a range of circumstances. Many times compassion is born out of suffering, and so that suffering is necessary, but must have a healthy expression in order to allow us to reap its benefits. Shades of Refrain speaks to what anchors me in the midst of an ever changing and turbulent time in history. The process of creating Shades was based heavily in the structure of the score. I spent a large amount of my time just listening to the music (Confluence, by Joby Talbot), and wrote a map of the arc of the music. This was coupled with abstract images and impressions of scenes described in Psalms, giving the work a melodic and lyrical overtone. The Mother is an interpretation of the poem by Pulitzer Prize author and Chicagoan Gwendolyn Brooks. It’s a poem that stands face to face with regret and refuses to blink. It presses right into the pain and allows the abortion of decades past to come bubbling to the surface with sorrow, rage and haunting visions of what might have been. This piece was very difficult to bring to stage, and required a huge amount of courage and introspection. Ultimately the subject of abortion lacks compassion in many forums. This ballet shows the devastation of one mother and her children, as Gwendolyn’s poem so vividly describes. The movement is a juxtaposition of realism and surrealism, beginning in a 1970’s living room. The movement was born out of contradicting angles, arches and planes in the human body. I tried to allow the movement to encapsulate the feeling of being at war with oneself. Many ballets are made to look free and full of abandon, this is the opposite, it’s made to look trapped and contradictory. The ballet is not linear in it’s progression, since the memory of the Mother is fragmented and disjointed. The Children move in and out, at times an imagined version of their childhood, at times they are adults, they are ghost-like and propel the Mother throughout her vision. It’s a haunting piece, but it gives you a new perspective on the anguish of the Mother and evokes a deep compassion for her plight. The process of creating this ballet was a deeply heartfelt motivation to share what is really the story of our times. The massive amount of people who are currently displaced from their homes and seeking refuge is startling – but the response of many nations has been even more disheartening. Strangers and Angels is set in New York, both 1917 and 2017. Strangers pass under the shadow of Lady Liberty eager for a fresh start and filled with hope. It is a look at hospitality and refugee immigrants, in the shadow of a nation wrestling with its heritage and its future. The piece is inspired by immigrants from the Armenian Genocide (1917) and the current Syrian refugee crisis as they seek solace and comfort in the Land of Opportunity. The characters are met with continued challenges and the loss of hope as they search for a home and find only closed doors. The process of creating this ballet was a deeply heartfelt motivation to share what is really the story of our times. The massive amount of people who are currently displaced from their homes and seeking refuge is startling – but the response of many nations has been even more disheartening. The movement in the work describes a people without a home. It is raw, instinctive and comes from some of the most universal human reactions to pain, stress and despair. During the process we tried to create movements that would evoke feelings of almost a post traumatic stress disorder, as the victims of war torn countries struggle to sleep with nightmares of what they have experienced. The second part of the process was to create a scene of wandering, a nomadic existence, an abstraction where the souls of the refugees are continually wandering, never finding a home. There is no rest, there is no comfort, they roam train stations, city streets and airports constantly searching for the new life they had hoped for. One of the most poignant moments is when 1917 and 2017 collide, and you see the Armenian refugees as ghosts, with hands outstretched, pleading for our generation to be the one that stops the cycle of ignoring and abandoning the refugees on our national doorstep.